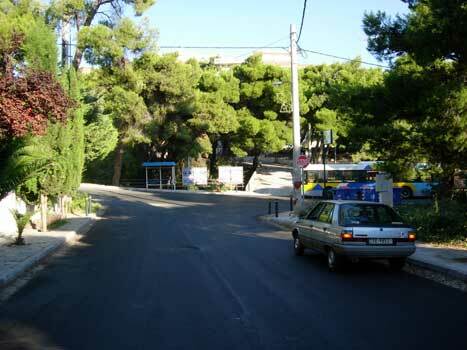 Take Kifissias Avenue going north (in the direction of Kifissia). Turn right for Melissia onto Odos Pendelis. (note the Maroussi platia & the Germanos building on the left-hand side as you turn). 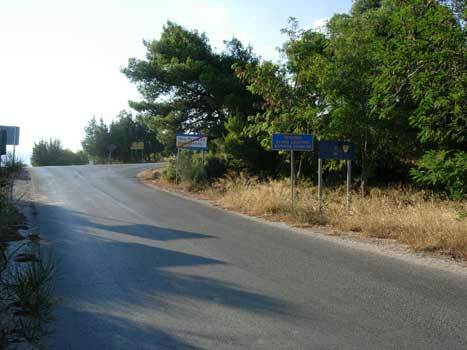 Keep on this road (it takes a sharp left & right bend over a bridge) and then becomes Odos Demokratias. 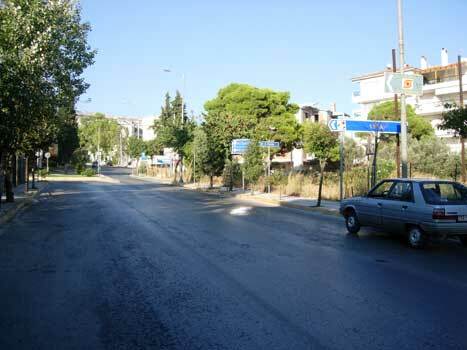 Continue up through Melissia high street & come to a busy junction. (note an Alpha Bank on the left and a Eurobank on the right). 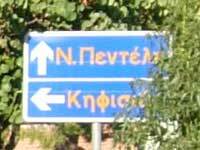 Go straight ahead (a slight left & right turn required) for Nea Pendeli (Do not bear right for Vrilissia). Reset your Odometer (Kilometres) to zero at this junction. 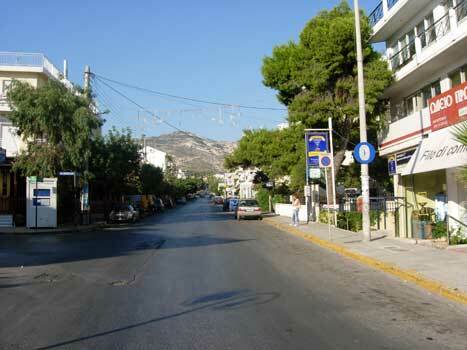 Get to Melissia high street going north & pass through the main shopping area. 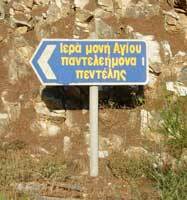 4.2 Turn RIGHT up mountain road signposted "Ag. Padelimona monastary - 3 Km"
5.1 Road levels out and parking is possible. You may want to stop for a view of the mountain. 6.4 Road Junction, Shrine, & left-pointing sign for the monastary dead ahead. Bear RIGHT here. 7.3 Turn right down bumpy earth track (this turn is just before a sharp left-hand bend in the road). 7.7 Track narrows and becomes rougher. 7.8 Cement workmans huts can be seen ahead on the right. 8.1 Park & walk unless you have a 4WD vehicle. (The cave is about 150 metres further along the track, on the left). Heading north towards Pendeli mountain immediately after the junction in Melissia. Note the blue circular "use snowchains" warning sign on the right. The Melissia Post Office is about 50 metres up the road on the right. in Nea Pendeli TURN LEFT towards Pendeli mountain. 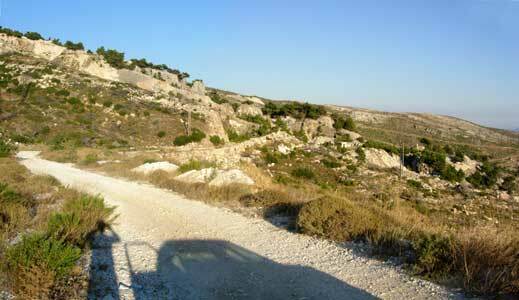 Immediately you will go up a steep hill section. 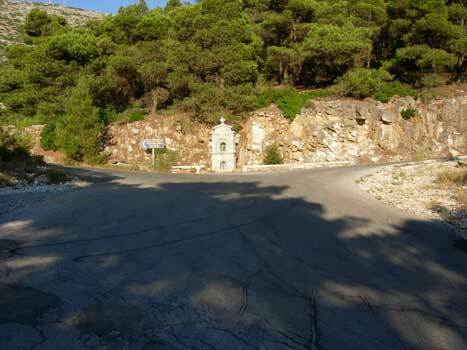 TURN RIGHT directly up the mountain road with pine trees either side. Part-way up the road levels-off and one can park on the right for this view of Pendeli mountain. 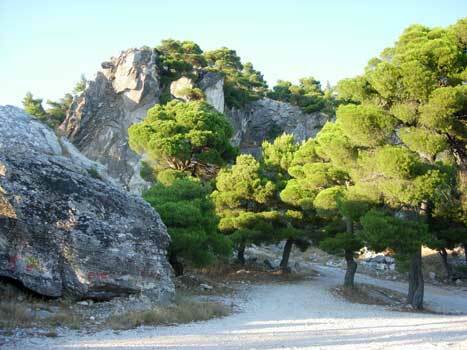 and are being re-forested with pine trees. 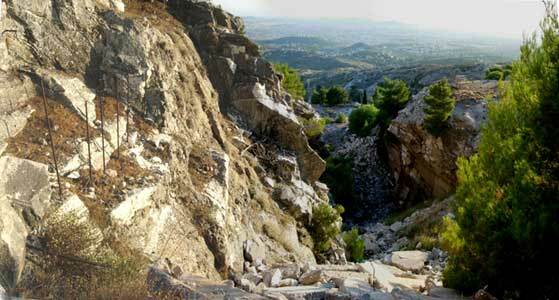 rough track towards Davelis cave. just before reaching the cave area. unless you have a 4WD. The cave is beyond the trees.